View the corrected motion capture animation on YOUTUBE.COM by clicking here. His response was "The reason why the hips appear floaty is because of the way the retargeting is done in Carrara/Daz/Poser.The Kinect does it's tracking by identifying bodyparts by looking at pixels in the 2D depth space and then relating them into 3D. This has the advantage of being very quick so it can be done in realtime, but it also means the limbs can have small variations in length." 5. Scale the imported skeleton to the size of the genesis figure. 6. Select the "hip" bone of the Genesis figure and change the Modifier from "IK Terminator" to "Inverse Kinematics"
7. Set the "object to track" to the New skeletons "hips"
8. Select the genesis figures "hips" and Import the BVH file with "Apply to select skeleton" selected. Now the hips do not float as they are linked to the BVH new skeleton's hips and the feet will contact the ground. There are still problems but the motion now looks a lot more solid. Hopefully this information helps others to avoid my mistakes. One of Sparrowhawke's free plugins has a drop-to-floor function. It might not save you time though, if you have to invoke it 900 times. I was messing around with the PyCarrara plugin (also free) to automatically position feet for a walk cycle. I imagine one could write a script to calculate the distance of the feet to the floor and drop the hip down so the lowest foot touches the floor. You could automate that over the length of your mocap. Thanks for the information, sparrowhawke3d has some amazing plug-ins. Unfortunately I get an error when I try them in Carrara 8.5 pro. Have you used them with the latest version of Carrara? I consolidated my posts in this discussion. View the motion capture animation on YOUTUBE.COM by clicking here. This is a another experiment with same technique as yesterday for Brekel Kinect Pro Body Motion Capture and Carrara Pro 8.5. This time I used a better motion capture BVH and a different Genesis figure. 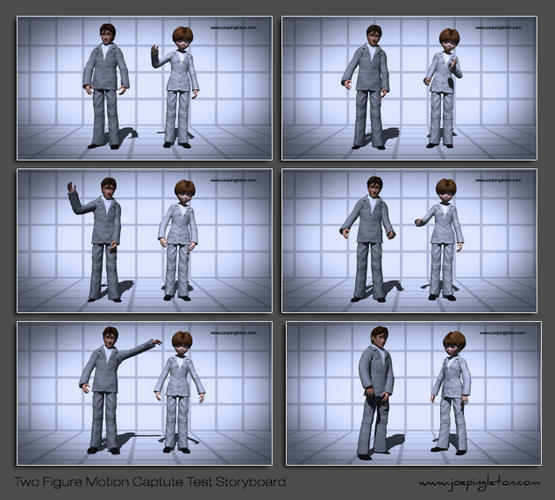 This experiment is all motion capture with no key frame animation. I think its my best result yet, what do you think? I own Ipisoft2 and can retarget directly in there, save BVH and import in to Daz studio. If I want the motion in Carrara 8.5 I create an aniblock in Daz studio and import that in to Carrara. Here is what I have been doing..
You wouldn't need to use this method as this technique is needed because of retargeting issues. Your results look a lot better than anything I ever got with Brekel Kinect Pro Body Motion Capture and DAZ. I have heard ipisoft is much better than berkel. It was too expensive for me to justify buying with out a client for it. I even bought a second kinect to use with the trail version, but the trial period ended before I understood it enough to buy it. If you are getting that good of results, it may be worth purchasing. Allowing for direct retargeting to genesis and other figures seems to be the best benefit. The biggest problem with Brekel is there is no retargeting, so you have to work around with DAZ figures and I am too dumb to figure a clean way to do it. Maybe I need to learn to use Motionbuilder, as I have seen some very good Brekel samples using it. Of course that the cost for that software is prohibitive too. Plus with two kinect support ipisoft allows for spins and better overlapping movement? Since Brekel only uses one sensor ant time a body part moves over another it it hurts the quality. Most movement crosses something else, so brekel is limited at best. Your results look a lot better than anything I ever got with Brekel Kinect Pro Body Motion Capture and DAZ. Plus with two kinect support ipisoft allows for spins and better overlapping movement? Since Brekel only uses one sensor ant time a body part moves over another joit it hurts the quality. Most movement crosses something else, so brekel is limited at best. You wouldn’t need to use this method as this technique is needed because of retargeting issues. I bought Brekel Pro and Face for $75 bundled together and have spent a lot of time and I am still not happy with the results. I'll have to try the space blanket trick. 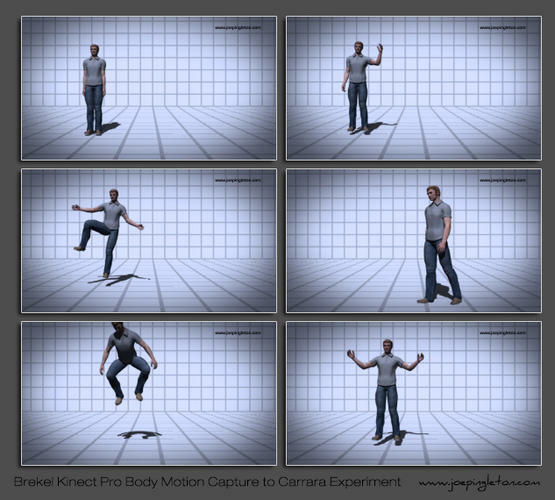 Today's experiment is again with Brekel Kinect Pro Body Motion Capture and Carrara Pro 8.5. This time I tried capturing two figures at the same time with Brekel Kinect Pro Body. Then I simply imported the BVH files and rendered the result, kind of a workflow speed test. I think I found the best solution for foot placement issues in the second part of the video. This experiment is all motion capture with no key frame animation. Thanks for posting these helpful tips. For some reason I can't get the arms on my genesis model to track with the brekel bvh. Everything else tracks fine: hips, legs, etc. But the arms remain in t-pose. Any suggestions?